"I play an early 80's hollow body, with early 70's p90 hum buckers in it. Through a Vox AC30, I get an even balance of tone, attack and subtlety, when needed. The Vox amps have a unique bark to them, without been too harsh at the top end. They are always running hot, which makes for a great, natural overdrive as the sound begins to break up when you wind them out. There is also a depth to the Vox sound, plenty of overtones whistling through, and keeping the sound nice and full. They are the amplifier that gives me what I need on a consistent level. I have recently been experimenting with the new AC30HW2X. These are as good as I have heard any Vox sound, and with the ability to switch between 15W and 30W, they are an amp for all occasions." 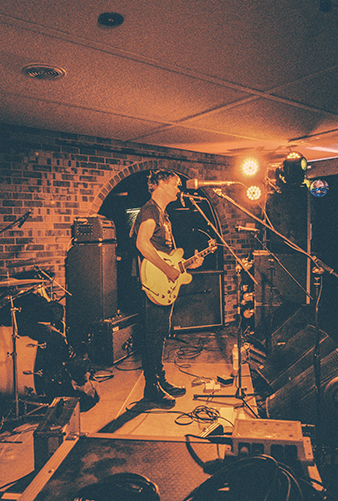 Blake Scott is the guitarist/vocalist for Melbourne band The Peep Tempel. Forming in 2009 as a two-piece, The Peep Tempel developed their distinctive sound in their studio/rehearsal space called the WingSing La. Living next door to each other Blake Scott and Steven Carter formed a musical bond that transpired into two 7 inch vinyl releases ‘Thank You Machiavelli’ and ‘Fatboy’. Both 7”s were released through Wing Sing Records, and found a receptive audience on radio throughout Australia. In early 2011 the Band added bass player, Matt Duffy, and headed into the studio to record their debut long player. The result is an album the Australian newspaper described as "near rock n roll perfection". The Peep Tempel live show is a blast of frenetic energy. Concise, authoritative and marked by percussive precision, angular riffs and raw power, with rolling stone Australia describing the live experience as Frenetic rock, pointed lyrics and one of the best live shows in Melbourne. Blake has been using Vox amplifiers for more than ten years, and in that time has built a close relationship with the AC30.